Little Eco and I enjoy upcycling old materials into something new. 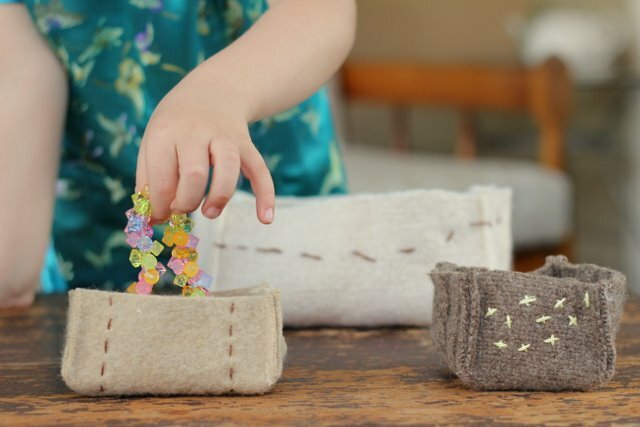 I often struggle to come up with quick and easy projects that we can complete in an hour or two, so we've been enjoying the inspiring project ideas in Kathreen's two latest Kids Crafternoon books: Kids' Crafternoon Felting and Kids' Crafternoon beading. Like the previous two crafternoon books, each book is filled with practical and creative projects that can be easily completed by beginner crafters in an afternoon. Little Eco and I choose to start by making a couple of the Zakka Stash Boxes (contributed by Suzie Fry) to organise her hairbrush and elastics. We used felt i'd created by felting a couple of old woolen jumpers. My approach to felting is pretty simple. I throw the woolen jumpers I want to felt into a pillow slip. They need to be greater than 30% wool and 100% wool is the best. I then simply toss the pillow slip into the washing machine and wash on hot (with whatever clothes I think would benefit from a hot wash given that I usually wash in cold water). 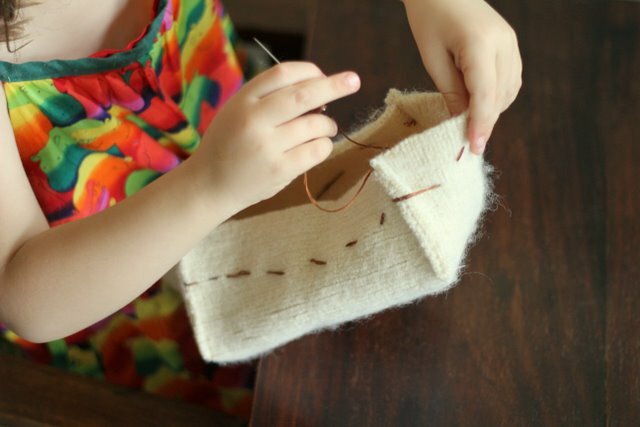 Kids Crafternoon Felting includes instructions on how to felt and 'take apart' woolen jumpers, along with instructions for all sorts of other cool stuff like wet felting, needle felting, and basic hand sewing stitches. The Zakka Stash Boxes were super easy to make. I'd cut the felt and sewn the boxes together in under an hour and then Little Eco helped me decorate them with hand stitching. Little Eco and the girls from up the road have already put in requests to make around a dozen projects from each of the books. High on the list are the Zombie Critter Charms, a felt wallet, and beaded badges and critters. Both books are available from Booktopia.